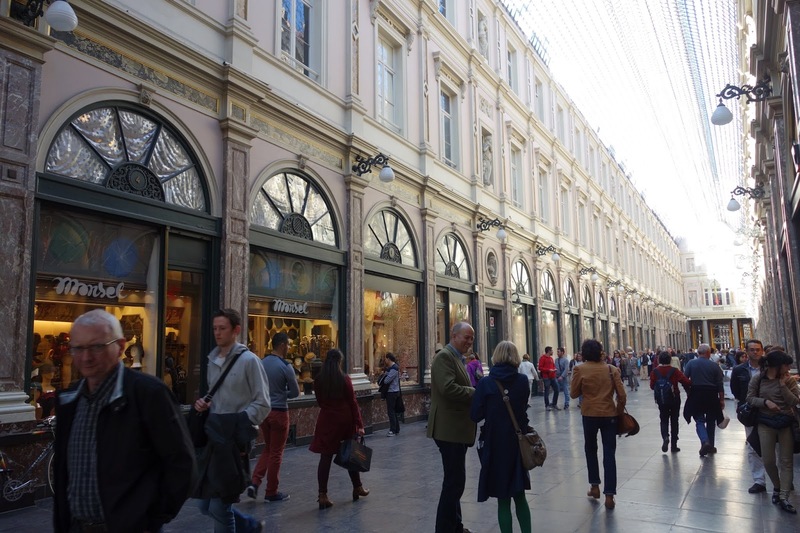 As excitement levels were high regarding the trip to Amsterdam next week, my friend and I went to Brussels on Monday to search for a Halloween costume. I returned to Leuven empty handed except from a huge 150x90cm Belgian flag I picked up for my room. It's currently placed on the wall beside my bed and I'm extremely pleased with how it looks - I'm planning a post all about my residence here in Leuven, so you'll see that soon! 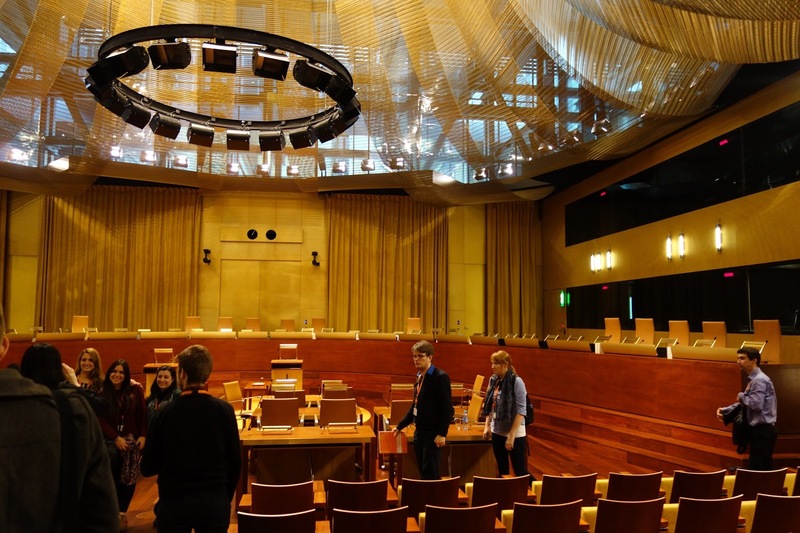 On Tuesday, we were heading off to the European Court of Justice in Luxembourg with my Constitutional Law class. 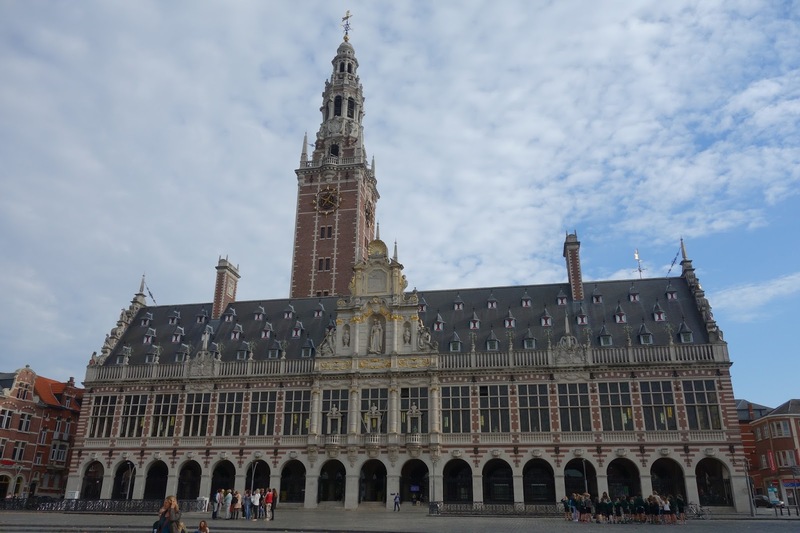 With the bus leaving Ladeuzeplein (KU Leuven library square) at 4:20am, an early night on Monday was inevitable. It took approximately 4.5 hours by coach to travel from Leuven to the court in Luxembourg. After constantly hearing about the European Court of Justice (ECJ) throughout my 2.5 years of studying law, I was really looking forward to the visit. We were briefed in the conference room upon arrival and entered the grand chamber to witness our assigned case of the day - Caner Genc v Udlændingenævnet. I found the case really difficult to follow as it primarily involved a conflict between European Law and Danish law - the latter I'm not familiar with. As the language of the case was Danish, we had to wear in-ear interpreters throughout the duration of the case. The interpreters were housed in little booths at the side of the Grand Chamber, speaking languages from all over the world. 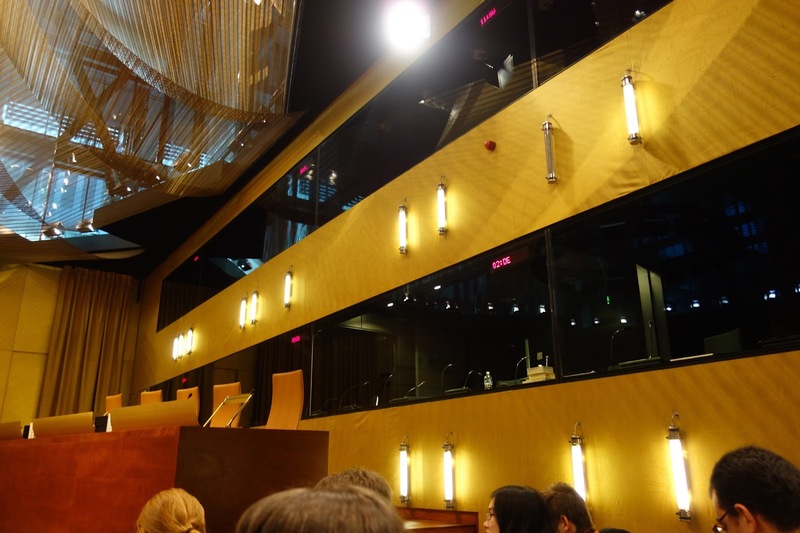 With 15 judges present in the Grand Chamber and the majority of boxes filled with interpreters, it baffled me how important this case was to the European Court. If I'm honest, I was a little bit bored after hearing pleadings from both parties and an exchange of questions and answers from the judges, so I switched to the German interpretation a couple of times. I haven't heard any German since the end of my 4th year at high school, so it was quite challenging, yet humorous, picking out single words I recognised amongst the foreign jargon. After the case had finished, we gathered for a quick coffee break then received a lecture from our Professor (who is also a judge at the ECJ!) back in the Grand Chamber. We were then escorted into our coach where we stopped for a quick lunch, then headed back to Leuven. Overall, the visit left me feeling quite deflated. 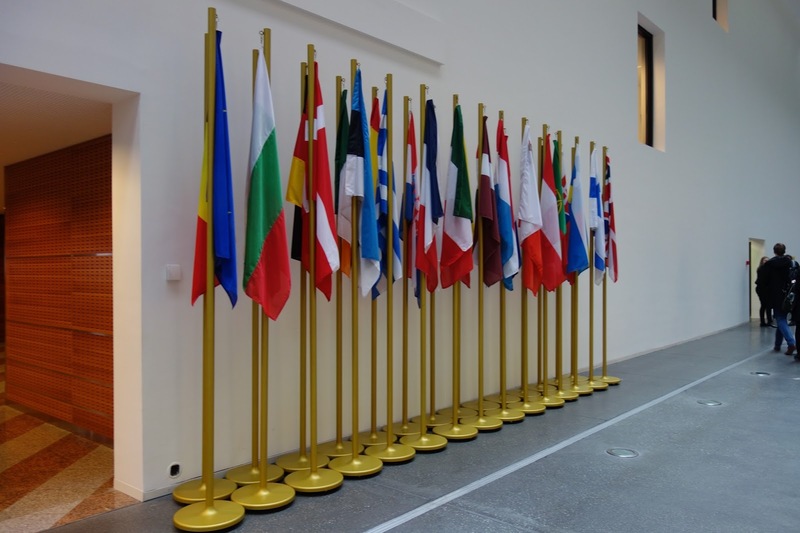 We entered through the back entrance of the building and missed seeing the flags outside the main entrance, so my expectations from google images were not satisfied. I also only saw the Grand Chamber, so I have no idea of anything else that exists in the ECJ. It had me questioning what my 25 euro trip fee was actually for. Regardless, it was fantastic seeing the Grand Chamber and I'm really glad we visited. 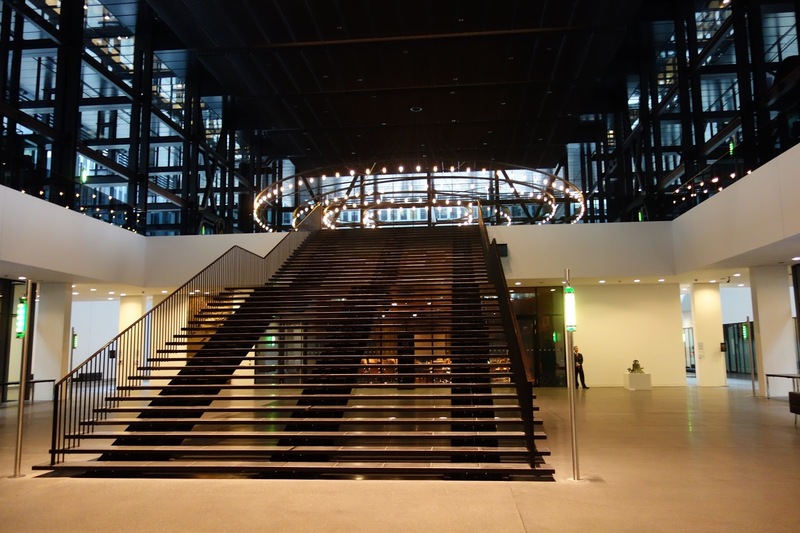 I know of very few law students who can say they've studied within driving distance of the European Court of Justice and have witnessed a preliminary ruling in the Grand Chamber! 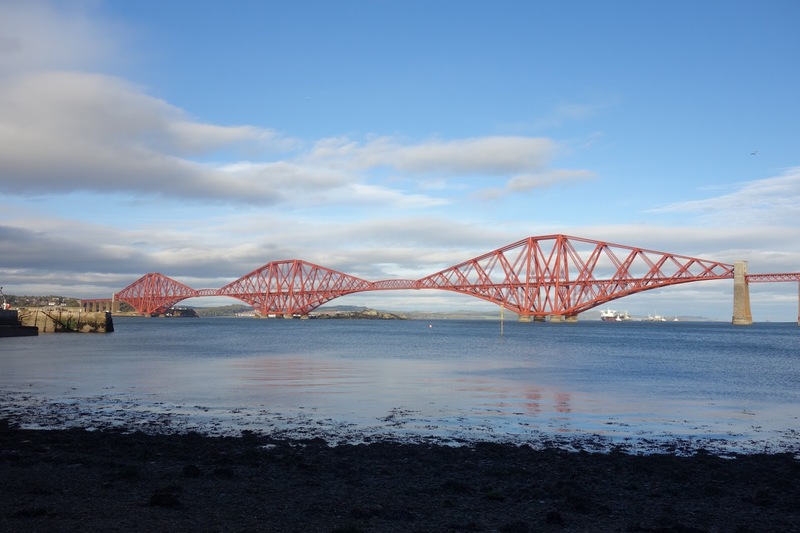 On Thursday, I headed back home to Edinburgh for the weekend. My Dad got married to his partner on Friday the 23rd and the only flights to Edinburgh available from Brussels International around this period involved a quick stop in Amsterdam. After realising I only had 20 minutes to jump on my connecting flight in Amsterdam, I had to sprint to the gate! Amsterdam Schiphol airport is HUGE and I even managed to sneakily jump to the front of the passport control queue with the permission of an airport attendant. I was utterly humiliated arriving red-faced at the gate after realising my flight to Edinburgh was delayed 20 minutes, just my luck. Upon arriving in Edinburgh, I was re-united with Gourmet Burger Kitchen and had a Chinese takeaway with my family later on in the evening. I also got my hair cut and had up to three inches cut off my hair - I'm still in awe and keep doing double-takes in the mirror as I miss my stupidly long hair even though it feels and looks a LOT healthier! 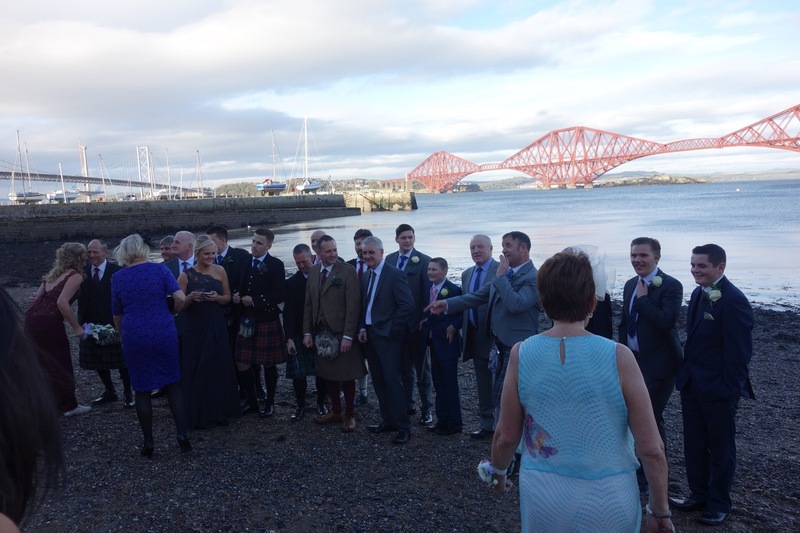 It was my Dad's wedding on the Friday and we celebrated it at the Orocco Pier in Queensferry. My Dad is originally from England, so half of my extended family are from Essex and we rarely see them, so it was lovely to catch up with them again throughout the day. 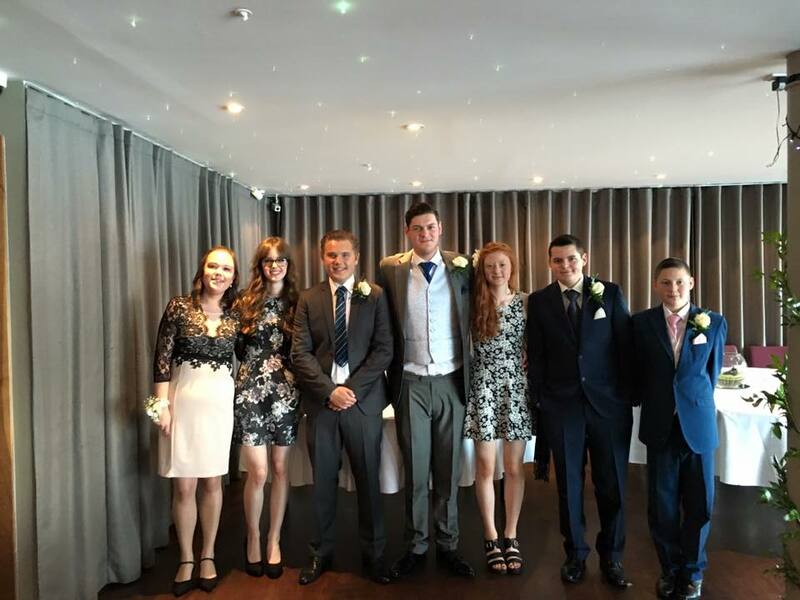 After the wedding itself, we enjoyed a lovely three course dinner at the Orocco Pier restaurant, followed by a reception in the function room. Traditionally, at a Scottish wedding, ceilidh music is played during the reception. It was really entertaining teaching my English relatives the moves. If it was a ceilidh with professional dancers (or people who actually knew what they were doing! ), there would be a lot more bruises involved! I had been craving a British roast dinner for weeks after moving to Belgium, so my Mum kindly treated us all to a Roast on Saturday. The rest of the weekend was spent catching up with family and friends. The weekend was incredibly hectic and I felt absolutely exhausted when I left Edinburgh for Brussels on Sunday morning. I picked up my lunch at Edinburgh Airport before boarding my flight and made conversation with the lady at the checkout. She asked where I was going and I replied saying I was really nervous to leave my family until Christmas and she left this lovely note on the back of my receipt! It definitely was a lot harder leaving Scotland for the second time, although everything was exactly how I had left it, seeing my family again made me realise how much I miss having their company in the evenings. 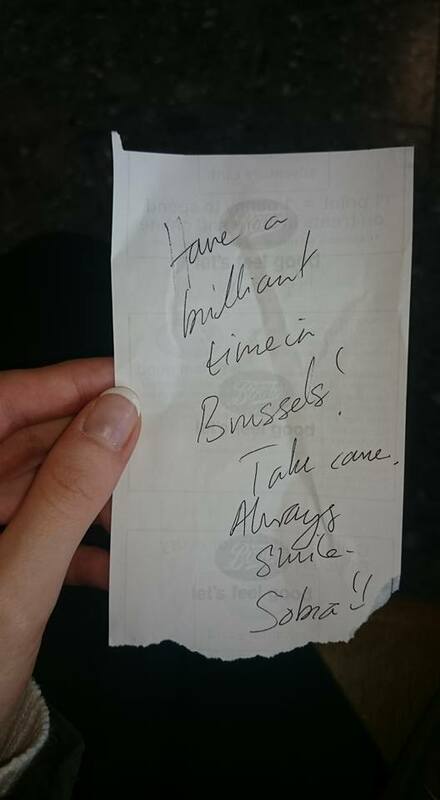 The note the lady left really did make my day and restored my faith in humanity - there are still some genuinely lovely people around in the world! Whilst being home for the weekend, I actually had a signed copy of Zoella's new book Girl Online: On Tour waiting for me, so I had my nose in the book for a good three hours as I waited on my flight to Brussels from Amsterdam - I'm loving it so far! This week has tired me out completely, so I'm definitely going to rest for a few days next week. 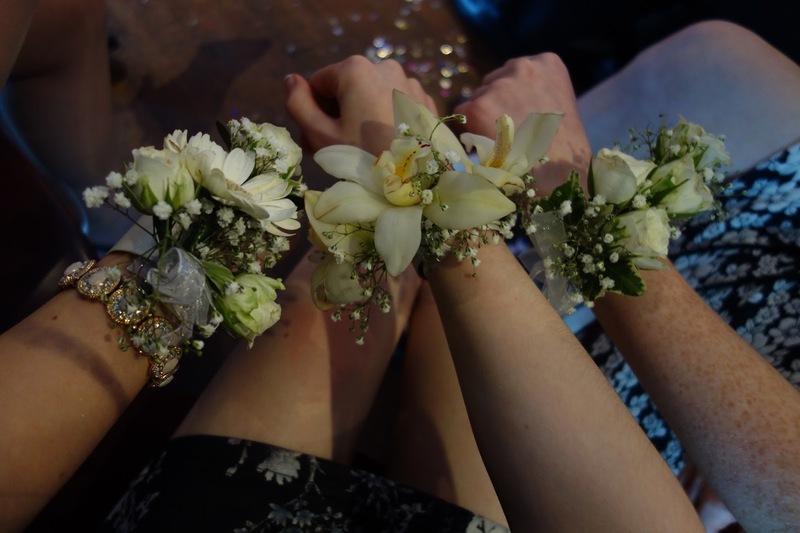 Also, next weekend is the big ESN trip to Amsterdam, so expect a lot of photos from Amsterdam in my next post! I've finally completed all my admin stuff here in Leuven! After sending my learning agreement to and from Edinburgh University to KU Leuven, my courses for the year are now finalised. This semester, I'm taking 24 credits in European Criminal Law, Constitutional Law of the European Union, International and European Human Rights and a criminology course in Terrorism, Corporate and Organised Crime. On top of this, Edinburgh University require for a further course in Advanced Legal Methods to be taken online. The workload isn't as much as students back home are given, but it does mean an extra few hours a week watching the recorded lectures and completing any additional written/practical exercises. I also know the dates, times and places for all of my exams up until the end of June next year - how organised is that?! Apart from attending lectures and sorting out paperwork this week, I've become a regular visitor to the ESN office. For those of you who aren't aware, ESN is the Erasmus Student Network who regularly arrange social events for Erasmus students here in Leuven (and 37 other European countries!). As a lot of their events are very popular, I've found they are often fully booked within minutes, so I ended up on the waiting list for their biggest trip of the semester. We received an email at the beginning of the week informing us that there was a few tickets left for those on the waiting list and we were to arrive at the office at a certain time in order to secure a place. After 2 hours of queueing, my friends and I managed to get last minute tickets to AMSTERDAM for the Halloween weekend! I'm incredibly excited. 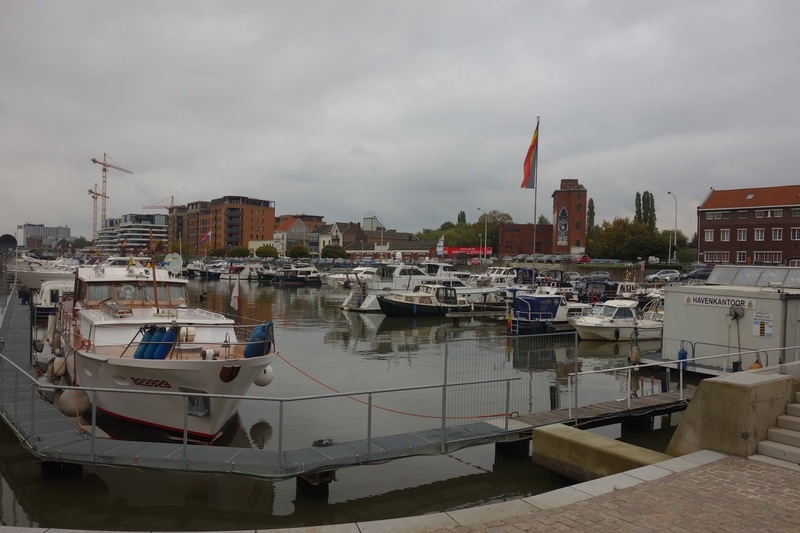 Whilst at the ESN office, I also booked a weekend day trip visit to Hasselt with the student network. 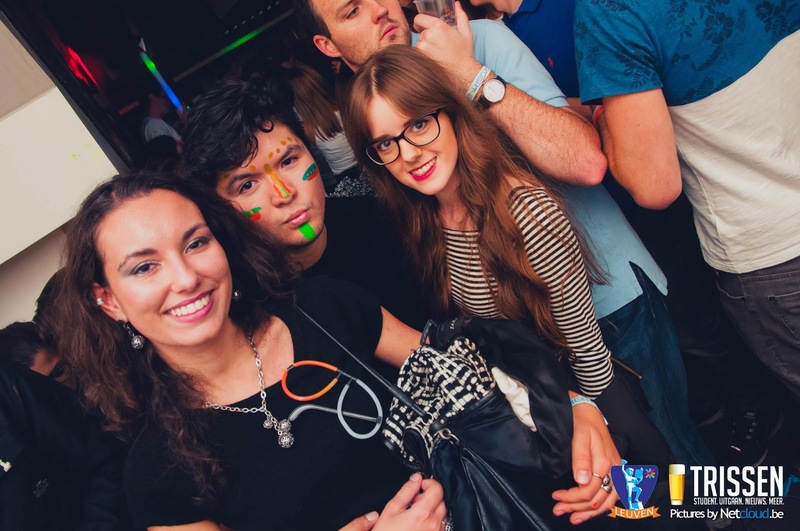 Besides day/weekend trips, ESN also have regular parties in Leuven throughout the semester. This Thursday, I went to the Lipton Big Splash Backlight Bash. I'm not a huge party goer, even at home I rarely go out clubbing, but I weirdly prefer clubbing in Leuven. You could turn up to a club in trainers and a pair of jeans and no one would even question it. Clubbing is a lot more relaxed, but the Belgians love their House/Techno music. The evening consisted of the DJ mixing modern chart music with a House/Techno beat - a bit of a strange mixture, but I weirdly enjoyed it. I've met more people this week and I went out for hot chocolate and a cake in the Vangroot Tea Room on Naamsestraat with some students I met after a lecture one day. I've also visited the ALMA student restaurant twice and Dwerf cafe (Hogeschoolplein) with friends. Everything is very affordable here - the student restaurant charges on average 5/6 euros for a main meal - so it makes going out to socialise a lot more easier than back home. I'd often turn down going out for dinner/lunch, or save it for a special occasion, back in Edinburgh as the prices are often too expensive! 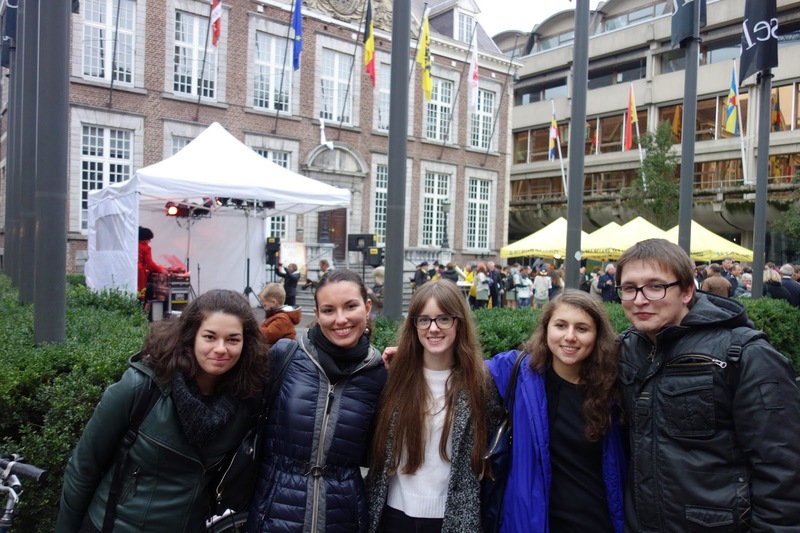 On Saturday, it was time for our day trip to Hasselt with ESN. Our plan was to spend a couple of hours in the Japanese Garden, then have some free time to explore the city later on in the afternoon. The Japanese garden was phenomenal! The garden itself is man made and it's surreal how much effort was put into the design - there is a LOT of symbolism involved - from rock placement to the change of water flow to represent the transition from life to death. 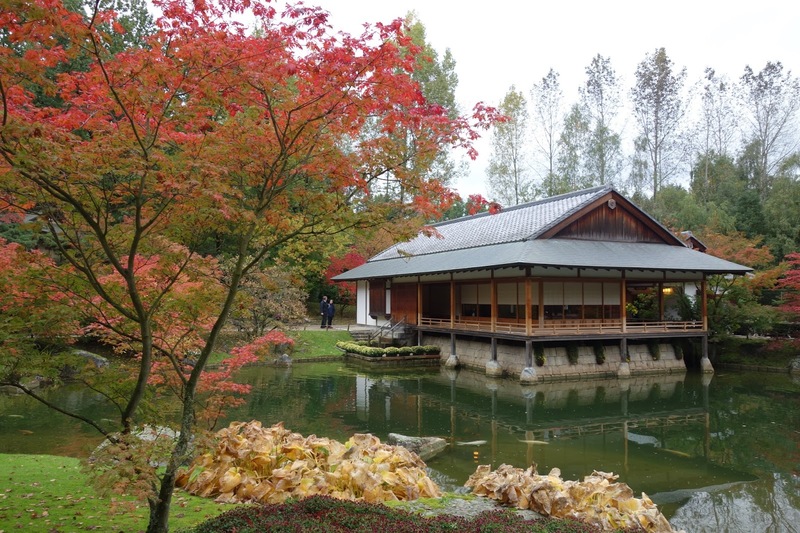 We also visited the Japanese house in the center of the garden where regular tea ceremonies are held. I was astonished that leaning the practise of a professional host can take a good few years of studying. I have seen a few Japanese houses in movies before and the inside of this house was exactly how I'd imagined it to look like, with Japanese sliding shōji doors and zabutons around the shallow tables. 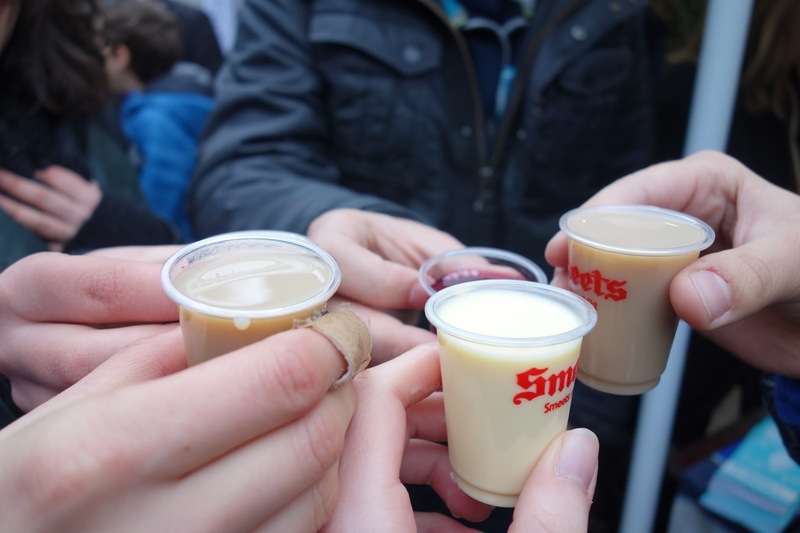 After visiting the Japanese garden, we walked back into the center of Hasselt and enjoyed the Jenever festival. The festival lasts two days and they even replace the fountain statue with Jenever during this time. I choose not to drink alcohol, but I felt obliged to make an exception by trying a shot of vanilla Jenever. I hate to admit it - but it was very enjoyable! Unfortunately, we arrived too late in the day to visit the Jenevermuseum, but we had a few hours to kill and decided to take a wander around the city. 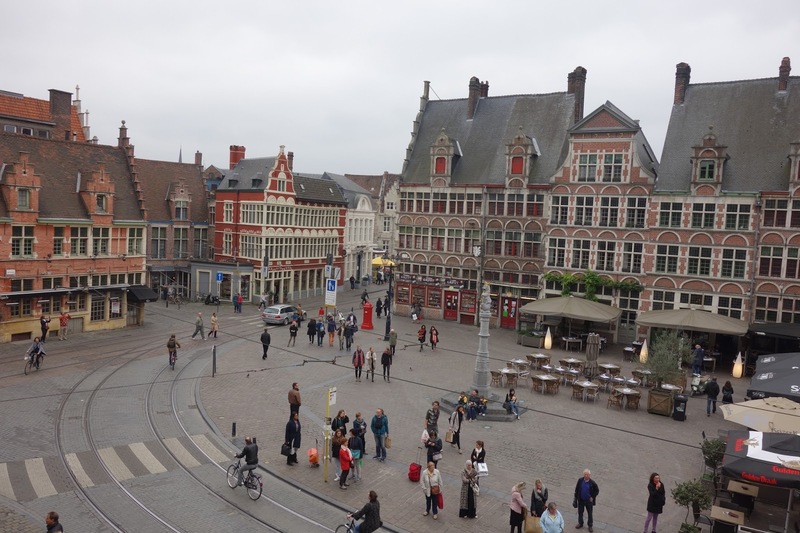 I've loved every city I've visited in Belgium so far, but Hasselt is my least favourite. 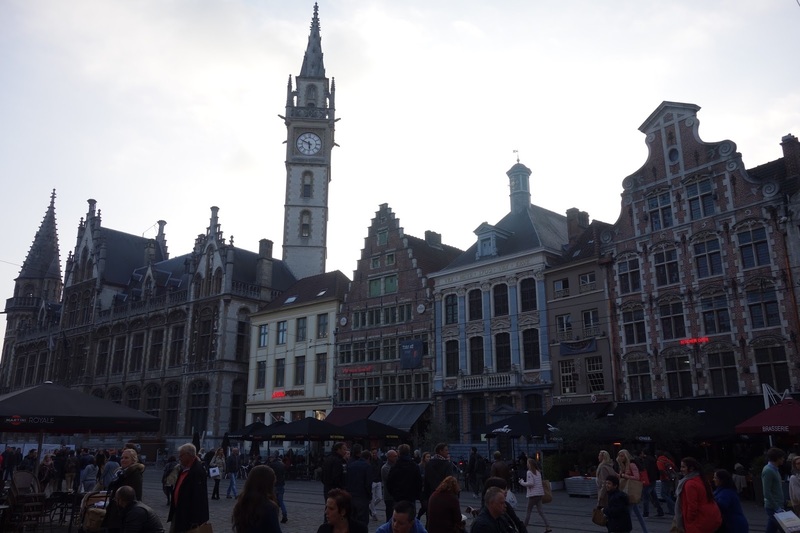 I felt as though there wasn't a lot to do nor look at, as I've found a lot of Belgian cities are pleasing to the eye, Hasselt did not live up to this expectation. 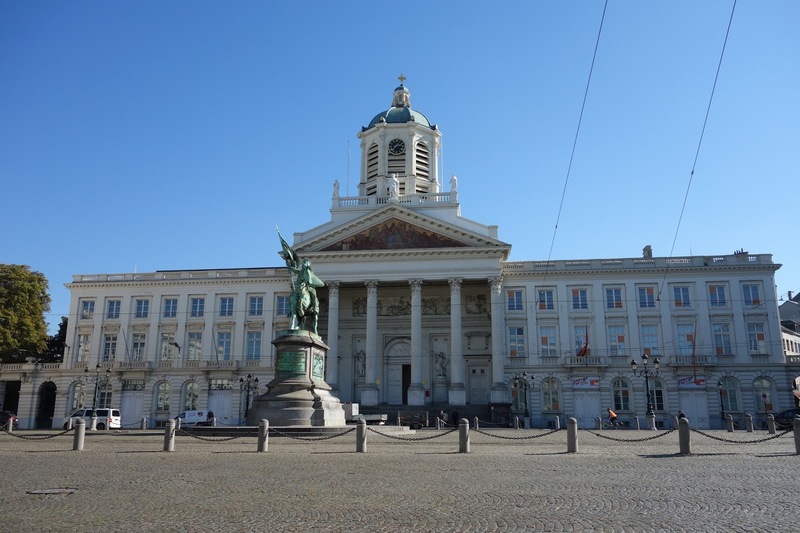 Regardless, we enjoyed a quick visit to Kempische Kaai (to me, the Leuven equivalent of Vaartkom) and the town hall. We met the rest of the group back at the train station in the evening. Una and I needed to go to the toilet quickly before leaving, so went to the station toilets. If you go to a public toilet in Belgium, you're likely to be asked to pay the toilet attendant before entering (very similar to train stations in the UK). There was no toilet attendant present when we entered, so we decided to enter anyway and pay on the way out if they returned. It turns out, the gentleman who entered before us didn't pay either and immediately pissed off the toilet attendant, who lashed her anger out on us! The toilet attendant blocked the exit of the toilets and shouted various phrases in Dutch at us, which we didn't understand a word of! We paid one euro for two toilet trips (40 cent each) and waited for our change. After 5 minutes of shouting and gesturing at us, she refused to hand us the 20 cent change to which my friend said "we'll sue you for the change!" (typical law student). I never thought in a million years I'd have money thrown at me by a foreign old toilet attendant - but it happened! That statement definitely hit a nerve! We quickly left the toilets and prayed no one else received the same treatment we did. It seems pathetic waiting around and arguing for 20 cents change - but the lady can't get away with ripping off everyone who enters, especially with the price clearly stated on posters around the walls! Dramas aside, we left for Leuven. 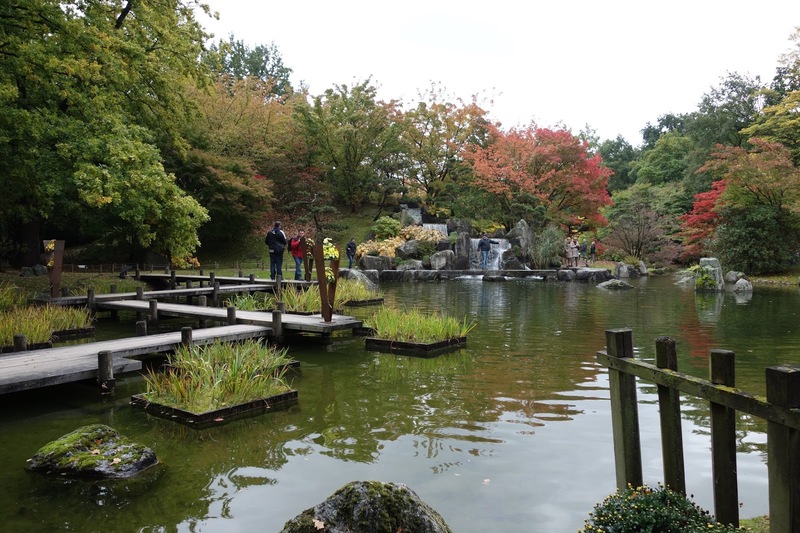 Although Hasselt didn't meet my expectations, it was only 12 euros for the entire trip including train fares and entry to the Japanese garden, so I can't complain! Next week is another exciting week - I'm going to Luxembourg for the day to visit the European Court of Justice with my Constitutional Law class then I'm going back to Edinburgh for the weekend to visit my family. I'm so excited!!! With Halloween just over a week away, it's time to start planning a costume for the occasion. This year, F&F at Tesco have released an exciting and extremely affordable Halloween clothing range. F&F have Halloween clothing to suit all party desires - from casual party wear to their new signature 'Day of the Dead' costume. So today, I thought I'd share with you some of my favourite pieces from their collection to fit any Halloween event this year! 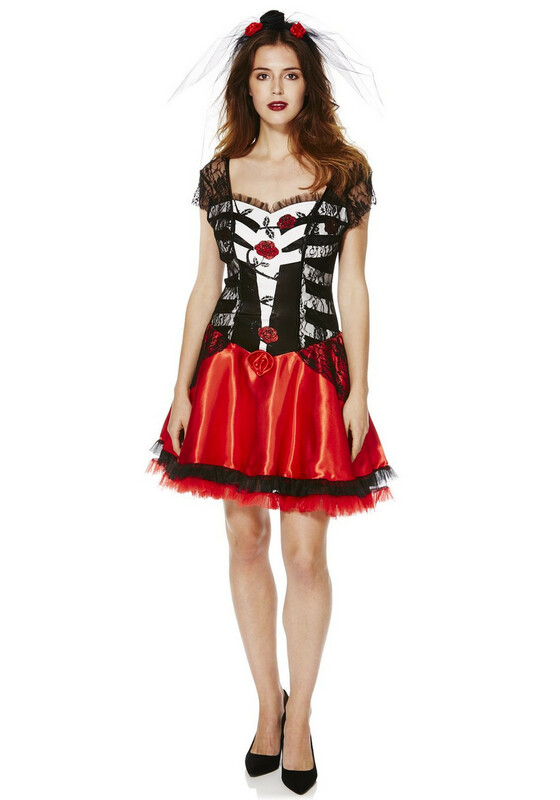 If you're going all out this Halloween, F&F's headline costume, the 'Day of the Dead', is one to look out for. Personally, I find a lot of Halloween costumes are quite unflattering and do not compliment a female figure, but with the delicate lace panels and rose detailing on this outfit, this costume is definitely a more appealing buy. The outfit also comes with a matching headband. Paired with some heels and red lipstick, an effortless and elegant Halloween look is complete! If you're going to a Halloween party this year but don't fancy going all out in costume - F&F are selling a faux leather dress which I have completely fallen in love with! The shape of the dress is especially flattering - short sleeves, a rounded neck and floaty skirt. If you're feeling a bit more daring, the dress is also available in burgundy and navy. 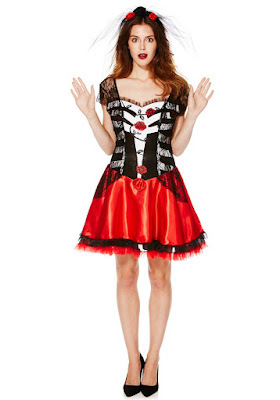 I think this outfit would look great paired with a black smoky eye. The best thing about the F&F Halloween range is that every piece is re-wearable and not only for the Halloween season. This black dress has a jersey top and embroidered skirt and is more on the casual side, but can easily be dressed up with a pair of heels or dressed down with tights and a pair of ballet flats. F&F have introduced a range of jumpsuits to their Halloween collection - perfect if you're looking for something different this Halloween. 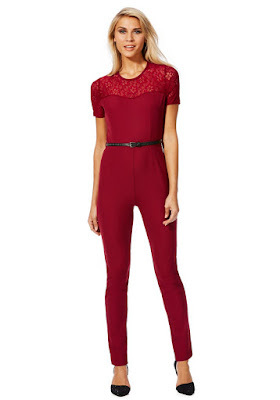 This full length lace jumpsuit comes in a blood red colour accompanied by a studded black belt. Combined with a pair of devil horns and you're ready to go! On the simpler side, this black full length jumpsuit is perfect for those who want to experiment more with makeup rather than the outfit itself. I think this would look great with skeleton makeup - the jumpsuit would give the overall look an elegant twist. The jumpsuit has lace cut out panels to add more interest to the outfit. If you're going to more of a laid-back Halloween party this year, F&F have an excellent range of tops available as part of their Autumn collection. 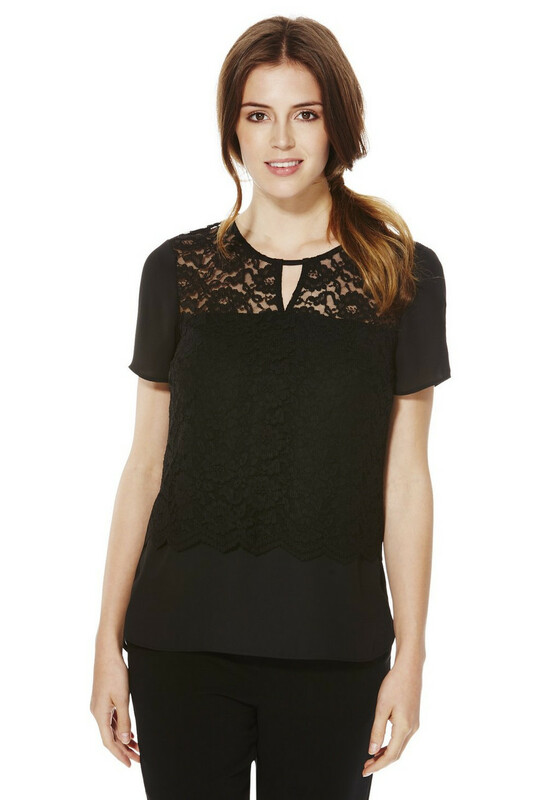 This black top has lace detailing and a cut out at the front and back. The top can easily be dressed up with trousers and heels, or paired with some converse. Finally, if you want to feel comfortable but still look on-trend this Halloween, these leather look trousers are for you! 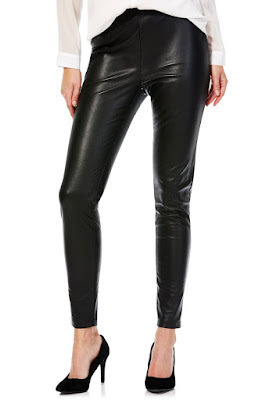 The leather-look instantly reminds me of Sandy from Grease and adds a bit of grunge to any Halloween outfit. The waistband is elasticated with a silver zip at the side. 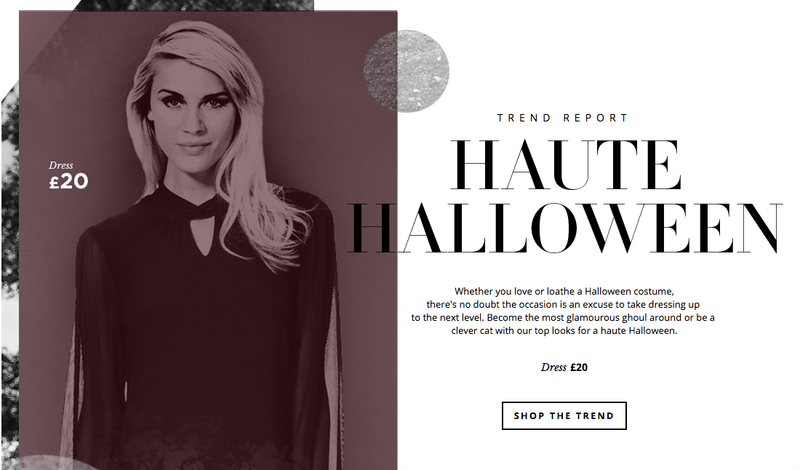 For more inspiration and to view F&F's complete Halloween collection, click HERE. Looking for some hair inspiration this Halloween? Daniel Lynes at Toni&Guy created a hairstyle to match a 'Day of the Dead' makeup and costume look. You can watch the how-to video HERE! The start of every week, for me, begins with a lot of errands to run. This week, I had to pop into the bank to sort my card as I didn't set it up properly (I'm blaming the non-English ATM's!). My landlord also sent me an email asking for rent to be paid the next again day, which caused a lot of panic and frantic messages back and forth to my Mum for advice on how to pay for it. Thankfully, one of her friends recommended 'Transferwise', a peer-to-peer overseas money transfer service. After a lot of researching I discovered that (in very basic terms) the company have bank accounts all over the world - if I put money into their UK bank account from my UK account, using the real exchange rate, they will put Euros into my Belgian bank account out of their Belgian account, thus avoiding international transaction fees. Clever, right? Thankfully, I managed to complete all of my errands before I unexpectedly became unwell during the middle of this week. At this point, I really missed having someone around from home to make my meals and keep topping up my hot water bottle, but I managed nonetheless. After being unwell for three days, I managed to completely empty the contents of my fridge and cupboards, so a food shop was essential. Luckily, there is both an ALDI and LIDL within a 10 minute walking distance, so I've been going there for my weekly/fortnightly food shop. Any other items, especially branded products (Heinz ketchup, Ben&Jerry's etc. 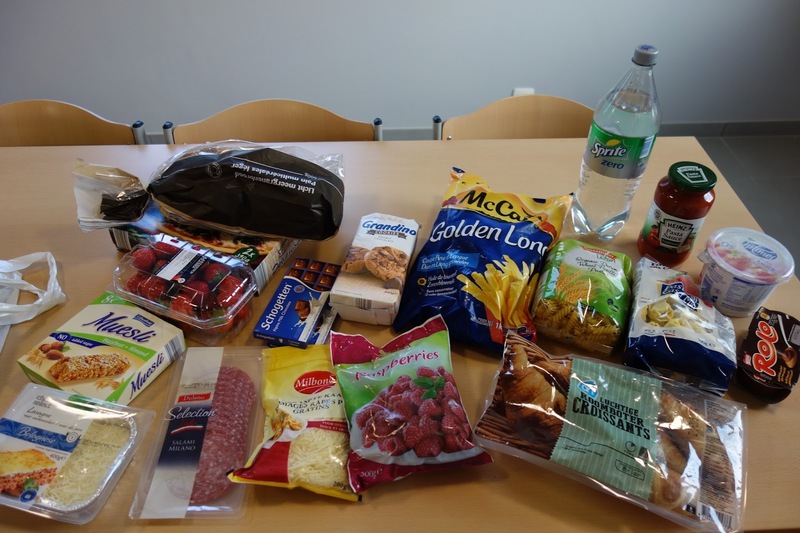 ), I've been buying from Albert Heijn. 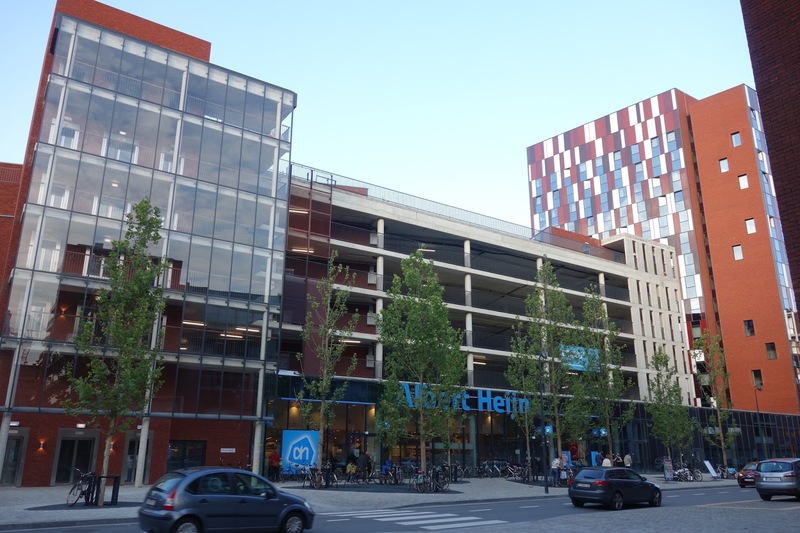 Albert Heijn is actually situated in between the tower and beam of Waterview Residence. So, if I take the lift down to the car park, there's another lift there which actually takes me straight up to Albert Heijn without stepping foot outside (essential when I'm feeling and looking slightly worse for wear!). I'm still trying to work out what I can manage to eat on a weekly basis, but I successfully managed to make my way through most of my food last week without any wastage. As you can probably tell from what I bought this week, I'm extremely lazy when it comes to cooking. I'm happy enough to boil some pasta or shove a pizza in the oven, but anything beyond that and I'm pretty useless. I've been living on croissants/strawberries in yoghurt for breakfast, salami and mozzarella sandwiches for lunch and pasta/pizza/lasagne for dinner. Every week I'm slowly branching out with my food choices - this week I was really craving strawberries, so maybe next week I may actually incorporate some vegetables into my food shop. We'll see. After weeks of struggling with the washing machines and almost always leaving De Wastrommel in a grumpy mood, something brilliant actually came out of it. I made a very good friend! Whilst having lunch in College De Valk (Law School), I recognised someone who I had helped with the washing machines the previous week. We instantly added each other on Facebook and have planned numerous trips together in the future - how cool is that?! Una added me to a Facebook group chat who were planning a trip to Ghent and we ended up visiting on Saturday. I invited one of my law friends I met last month and we ended up meeting 3 other students at the train station prior to leaving. Impromptu trips like these have definitely pulled me out of my shell - I would've never agreed to a day trip without knowing anyone else beforehand - and half of our group didn't know anyone and just came along for the fun of it! 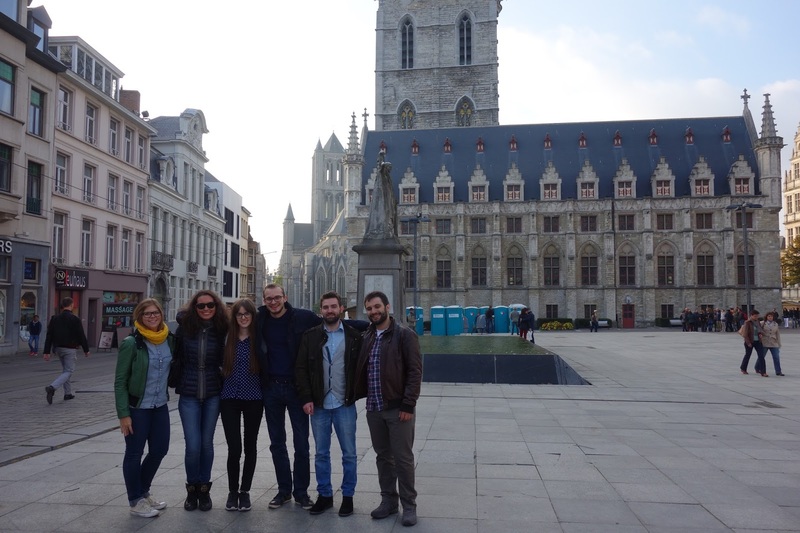 We also bumped into another group from Leuven whilst in Ghent and I had such a great time getting to know other people. The trip definitely encouraged me to join future day trips on my own and totally immerse myself in the student life here - what's the worst that could happen? Ghent (or Gent, in Dutch), is a medieval city in the north-west of Belgium. I'm aware of Ghent University, so I assume it's another student city like Leuven. 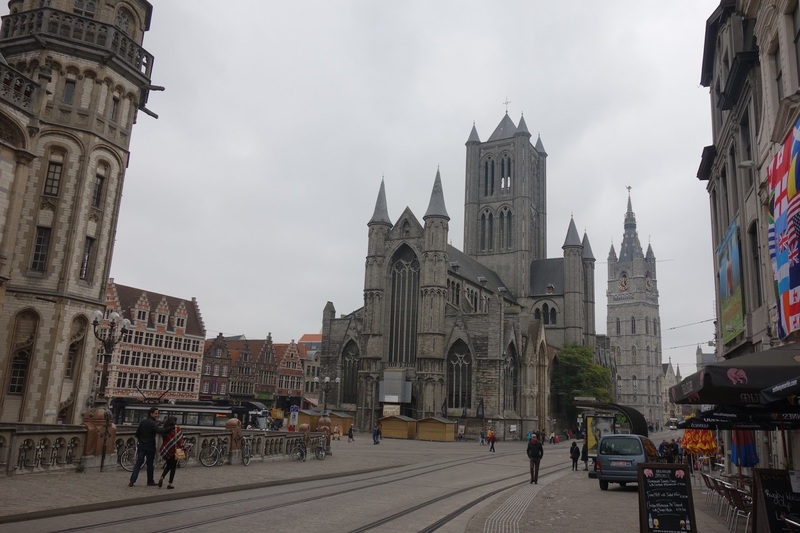 Visiting Ghent was up at the top of my to-do of places to visit whilst in Belgium. Our smaller group decided to leave slightly later at 10am, instead of with the larger group at 8am, and we took the 1 hour train from Leuven to Ghent. I bought a Go Pass, which allows for 10 train journeys within Belgium for 50 euros. The Go Pass is definitely worth the money if you're planning on traveling longer distances - a single ticket to Ghent from Leuven would've cost 12 euros otherwise! 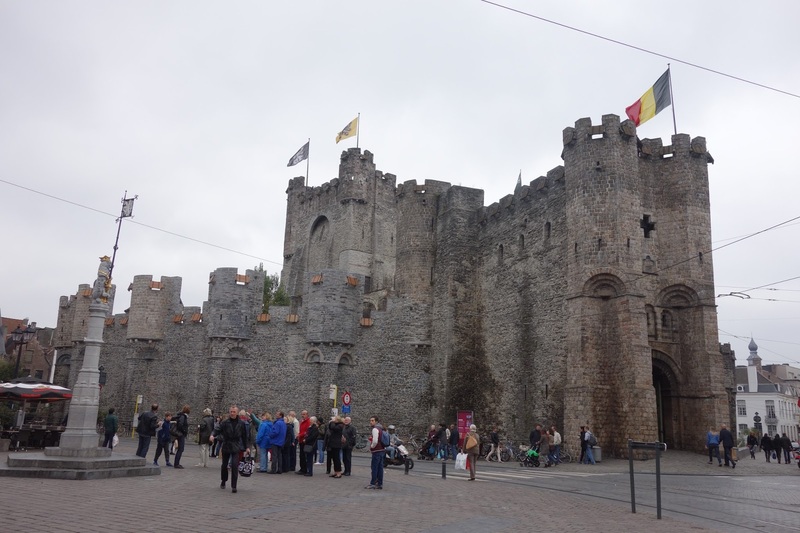 Upon arrival, we walked into the historical center and accidentally stumbled upon the Gravensteen. From afar, we were betting on whether the attraction was a city gate or a castle (I won - it's a castle!). We paid a small fee and walked around the exhibitions in the castle. Most of the information next to the swords/armour etc. was in Dutch, so it wasn't really educational for me, but I did enjoy looking at all the torture instruments and tools nonetheless. After stopping for soup and a sandwich at a local cafe, we met up with the larger group who recommended we visit Saint Nicholas' Church. The church inside was absolutely stunning - it reminded me of Westminster Abbey with the rooms inside, closed with large metal gates. There was also an underground exhibition with robes and armour on display. There was no entrance fee and I thoroughly enjoyed taking photos and appreciating the stunning architecture - definitely a must see! It was fairly misty for most of the day in Ghent. As you can see from the photo above, it made the city look very eery and accentuated its medieval architecture. I also noticed the weather is dramatically changing in Belgium as a whole. I travelled to Ghent in a long sleeved shirt thinking it would be fine after spending the day before walking around Leuven with only a T-shirt on (typical Brit!) - it's absolutely freezing now! I'm not sure how the weather has changed so quickly, but my priority next week is to purchase a Winter jacket. We rounded off the day trip with a quick drink in a bar before heading back to Leuven. I arrived back to my room beaming with happiness after having such a lovely day with new people in new surroundings. I say this every week, but things are only getting better here and I have (yet again) booked another trip next week! This time I'm going with ESN (Erasmus Student Network), so it'll be interesting to see how an organised trip is in comparison. It's been another jam-packed week here in Leuven. I'm slowly beginning to finalise my course choices now - I have a list of possibilities including EU Constitutional Law and Human Rights Law along with a list of courses I'm staying clear of (European Family Law and Discrimination law - too practical based for me!). I'm feeling as though I'm finally settling down here. I opened my Belgian bank account at the start of the week and I'm actually getting the hang of doing my own washing - the correct temperature and even the right detergent this time! 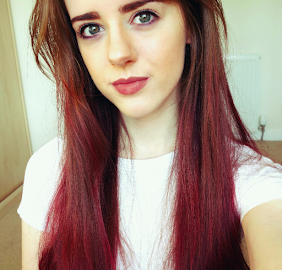 Things were pretty slow and boring towards the start of the week, which mainly consisted of classes and running errands, but I cheekily gave myself a few days off Uni Wednesday-Friday as I TURNED 20! My birthday actually wasn't terribly enjoyable. I've made a couple of friends here, but not enough nor is there anyone I'm that close enough to to ask if they wanted to celebrate it with me. So I made sure I kept myself busy with classes in order to keep myself occupied. Unfortunately, my 9am European Family Law class was pretty horrendous. We were assigned to do a presentation on the Family Law in our home countries in the middle of the semester, which actually counted towards our final mark. It did have me wondering why on earth a presentation about Scottish Family law (which I spent a semester studying in first year) would appeal to me - so I'm hoping to drop that class indefinitely. A class on Terrorism and Corporate crime followed Family law. I really enjoyed the introductory lesson, but since it's a criminology course, I'm struggling to understand some of the terminology used by the lecturer. All it takes is a little more effort outside of class though! Finally, my long academic day ended with a lecture on Discrimination law. I, embarrassingly, left this class during the 10 minute break an hour into the lesson. A series of mooting competitions scheduled for the year alongside a different approach to teaching - putting an individual on the spot in front of approximately 150 people - didn't appeal to me at all. Plus, I realised I wasn't overly interested in the course after the short introductory PowerPoint. Overall, my birthday wasn't terribly great but meeting Ken at the train station in the evening made things a WHOLE lot better. It's scary thinking I've been here for three weeks already but after seeing a familiar face from back home it really did hit me how much I missed home and the people back in Scotland. A lot of tears were unexpectedly shed at the train station and he very kindly treated me to an Ellis Gourmet burger meal in Muntsstraat. I've been bombarding Ken with photos of Leuven - from the Law school to the supermarket where I grab any urgent essentials - so the first couple of days were spent showing him around. We even treated ourselves to our first ever Belgian waffle (which I didn't actually like so much - the caramel topping made it too sickly even for a sweet tooth like me!). I have found the whole buying household essentials business quite stressful. Waterview is only a 15 minute walk away from the city center, so I've coped with making trips to and from HEMA for my room and kitchen essentials, but I was really in need of an IKEA trip. With Ken visiting and an extra set of hands to help with shopping bags, we took the bus from Leuven to IKEA Zaventem (just outside Brussels), where I bought some bits for my room. As Ken travelled with only hand luggage, he very kindly gave me Euros for my birthday instead of a gift so we decided to put that money towards making my room more homely. I bought a set of fairy lights, a lamp for my desk, cushions for my desk chair, a new duvet set, a mirror and a bath mat. I still have a few more things to buy but once my room is finished, I'll show you what it looks like! 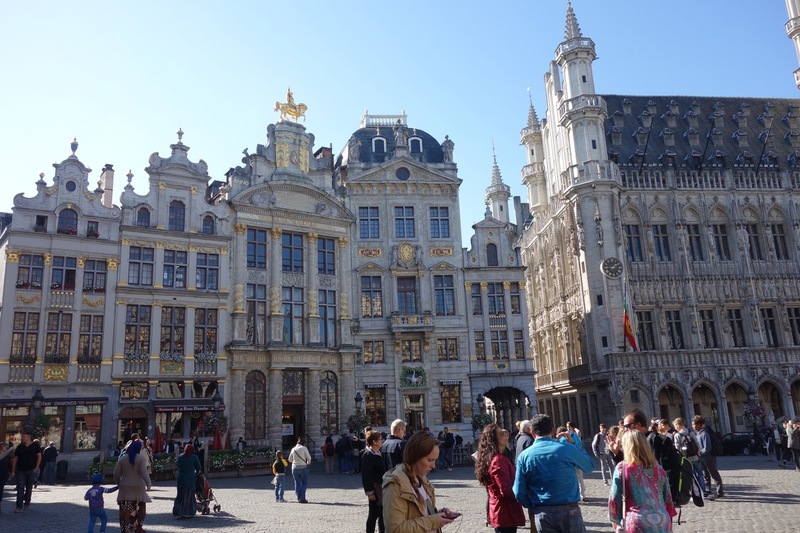 On Friday, we decided to travel to Brussels for the day. 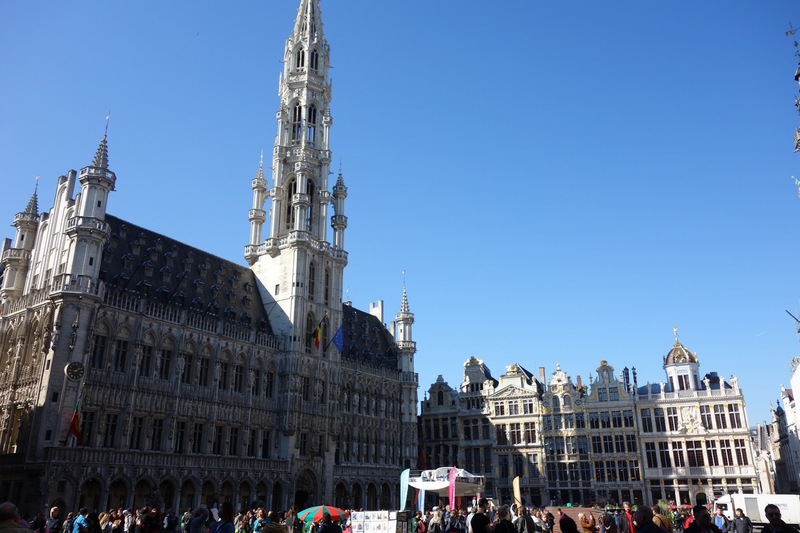 I visited Brussels when I first flew out to Leuven in July, but we only spent a couple of hours there so I was interested to see what else Brussels had to offer. 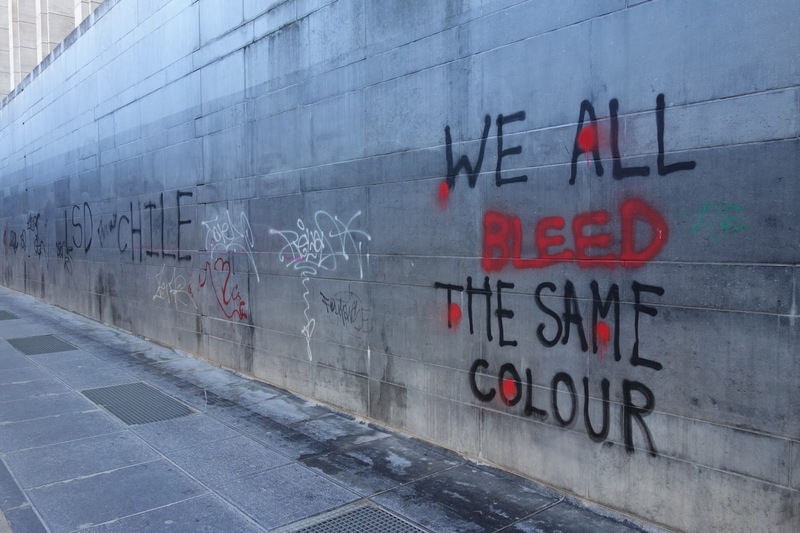 We first went to Brussels on the Belgian National day, so the atmosphere was completely different this time around. The city was still jam-packed with tourists, but it had more of a chilled out vibe. 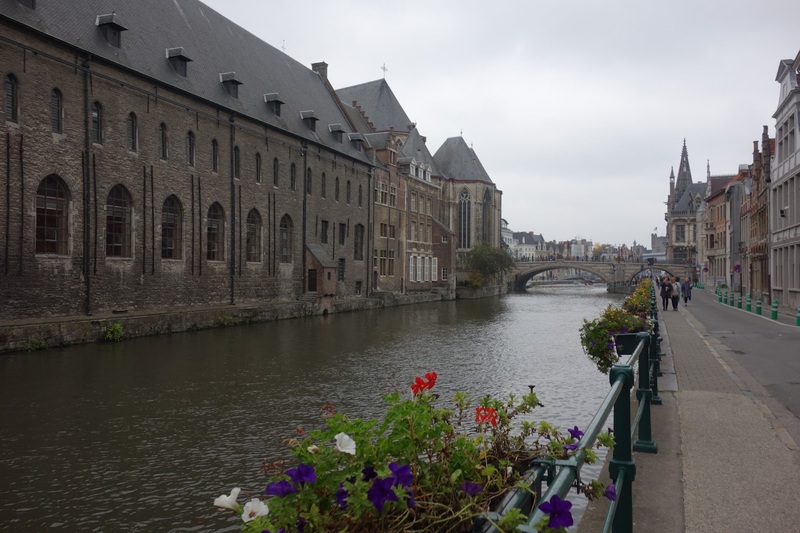 We visited the typical tourist attractions including the Cathedral of St. Michael and St Gudula, Mont de Arts (one of my favourites) and Galerie Du Roi. We then took the outside lift down to Ascenseur Des Marolles, had a drink outside and headed back to Leuven. 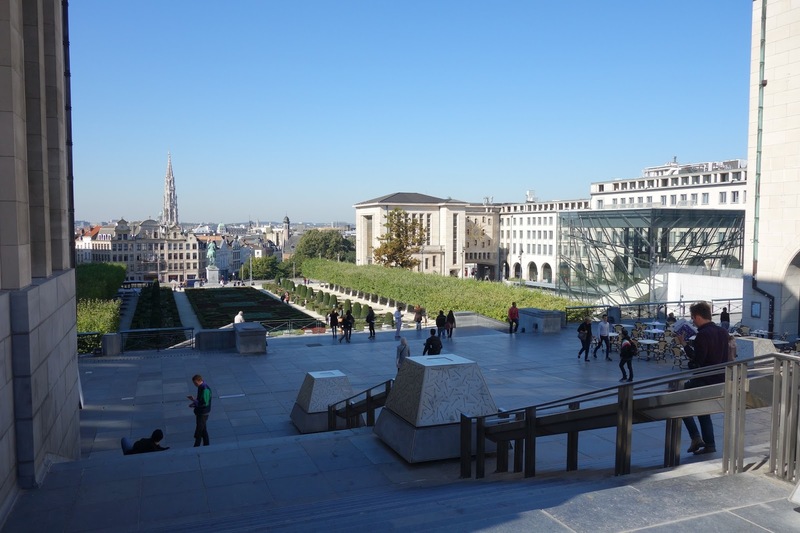 I do enjoy visiting Brussels, it's completely different to Leuven, but it reminds me of the busy city life I'm used to back in Edinburgh so I like it in that respect. I'm not sure if I would live there though - it is very big and as a student I much prefer settling down in a small town like Leuven. I still find it fascinating the main language spoken in Brussels is French and the main language in Leuven is Dutch, despite being only a 20 minute train journey apart! Once arriving back in Leuven, we went to Burger Folie for dinner. The cheeseburger I had was to DIE for and it was so lovely having a meal outside with the heaters on and blankets on our chairs to keep us warm - I would highly, highly recommend eating at Burger Folie if you're ever around Leuven! 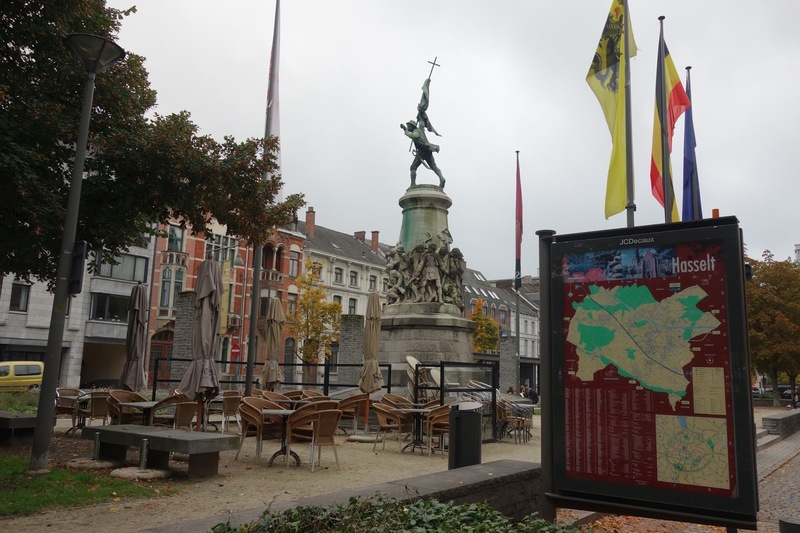 We rounded off Ken's second to last day in Belgium by walking down to Heverlee, just south of Leuven. There is actually a KU Leuven campus in Heverlee also - the campus itself is very peaceful and is surrounded by acres of greenery and bridges crossing the river. Just next door to the main campus is Kasteel van Arenberg. I'm not entirely sure what the castle is used for nowadays, but I assume it's part of the KU Leuven campus as I spotted some 'KU Leuven' posters inside the building. 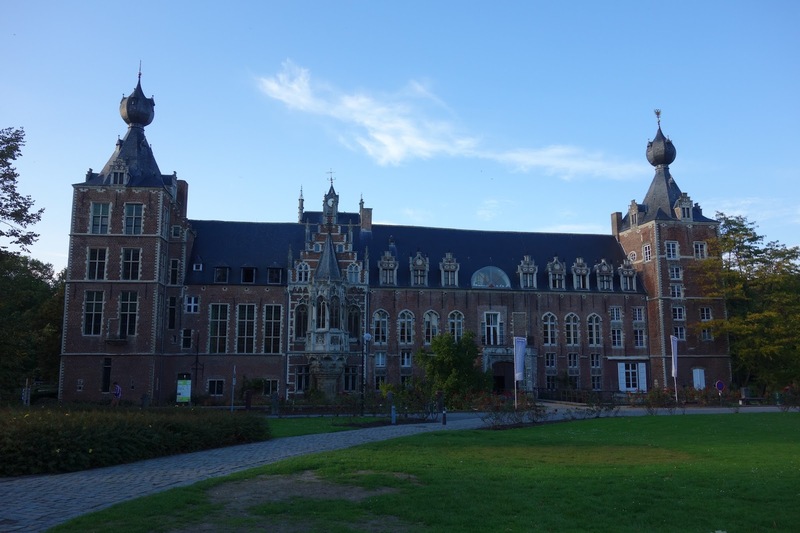 To be honest, Kasteel van Arenberg looked a lot more beautiful in photos online than it did in person, but I heard it was a must-see living in Leuven, so I'm glad we visited nonetheless. As it was Ken's last evening in Belgium, we treated ourselves to an Italian dinner. Within a 5 minute walk from Kasteel van Arenberg is 'Restaurant Paolo'. Situated in a lovely building off the main roads, we felt like we were dining in someone's house! The food was fantastic and the staff were super friendly and very kindly explained the Dutch menu in English to us. 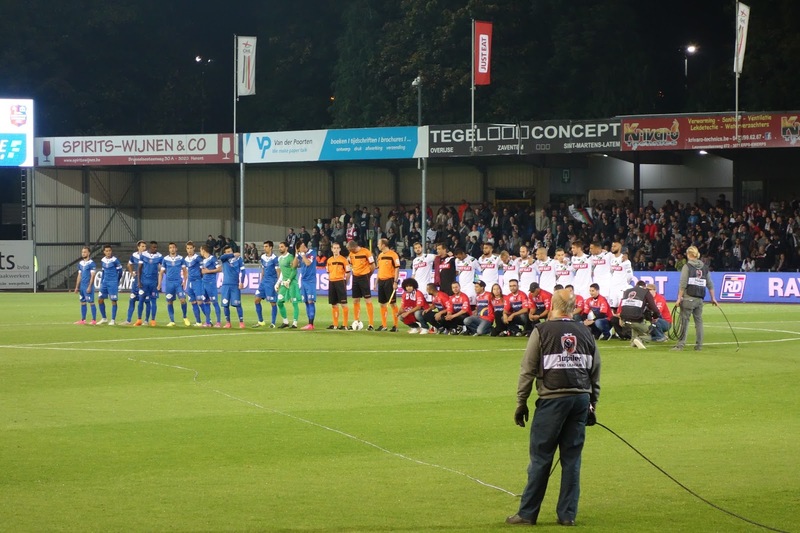 As the OH Leuven football stadium is in Heverlee, we decided to watch them play Royal Mouscron Péruwelz on Saturday evening. We stupidly gambled and bought a £30 ticket in the front row of the AB block - where we sat right behind a horizontal pole and could barely see the pitch! After analysing the seats behind us, we realised a few seats behind were free and watched the second half without having to sit on our legs to see the pitch. The game itself was very exciting and ended with a score of 1-1 (both penalty goals for both teams). After a relaxed few days, Ken left on Sunday and it was back to reality for me. I cleaned both my room and communal kitchen from top to bottom on the Sunday evening - my parent's couldn't quite believe it! Next week is another week full of lectures, but I have a few days off towards the end of the week with an exciting day trip planned - so stay tuned for my next post!